The Netherlands gained two new panoramic viewpoints over the weekend, one in Amsterdam and one in Rotterdam. In Amsterdam, the former Shell offices on the north bank of the IJ reopened on Saturday with the name Adam Toren. 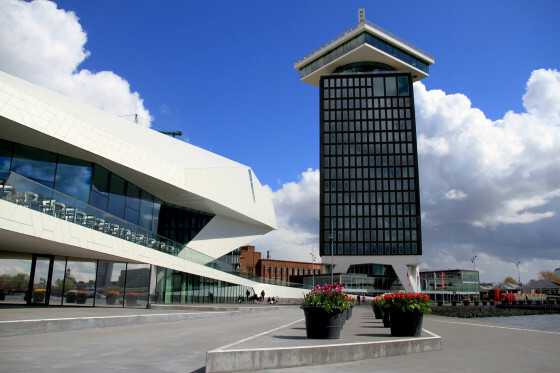 The 80 metre tower offers a fast lift service to the observation deck with views as far away as the coastal dunes and Utrecht. The price of a ticket for the lift – €17 – makes the trip one of the more expensive tourist attractions in the city. Most of the first day’s visitors – who paid a reduced fee of €15 – said the trip up was worth it, although one pointed out on Twitter that the Eiffel tower is cheaper at €11. The building also contains music company offices, three restaurants, a hotel and has a club in the basement and will be open round the clock. The Adam Toren project, four years in development, is an integral part of efforts to reposition the northern bank of the IJ as a creative centre. In Rotterdam a temporary flight of 180 steps has been built to the roof of the Groot Handelsgebouw near the main railway station, as part of the city’s celebration of its post World War II reconstruction. On the roof, visitors can look out over the city from a large terrace, which will also host films and performances. The steps, designed by architects office MVRDV, are made up of scaffolding and will be demolished again on June 11.